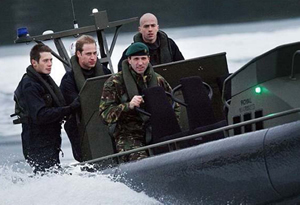 The second in line to the throne this week had a run in one of the three ORCs stationed with Faslane`s Royal Marines Fleet Protection Group. The prince joined marines as they carried out early morning exercises in his capacity as Commodore-in-Chief of Scotland and Submarines. Two ORCs along with several RIBs and a helicopter were used to simulate an early morning ship-boarding exercise on the Clyde.